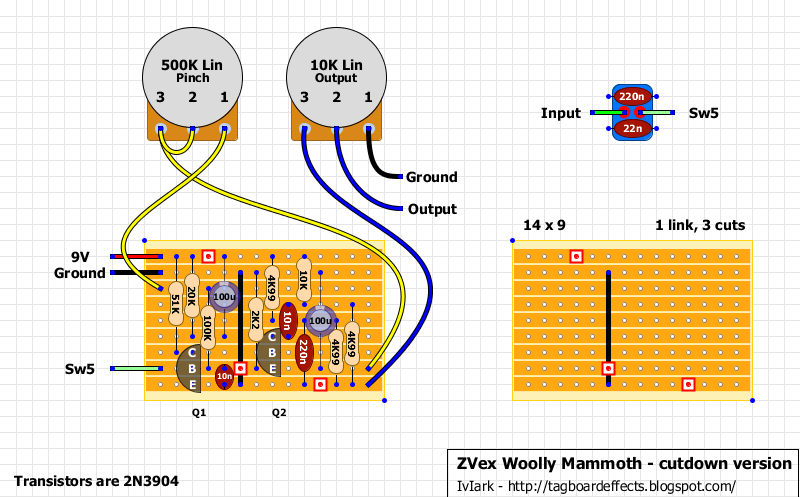 Vince on here asked me if I could adapt my layout to make a 2 Knob Woolly Mammoth with just Pinch and Volume controls. He wanted me to remove the Wool pot simulating it being set fully clockwise, and remove the the EQ pot and simulate it being set dead centre. The Wool pot was easy enough, it just takes the 100u cap from the emitter of Q3 to ground in the clockwise position, so I could connect that directly to ground. The EQ pot was 10K and so I used two 4K99 resistors from where lugs 1 and 3 of the EQ pot would have connected, and taking the other side of both resistors to the same row simulated the centre setting. If you want to alter this slightly just socket them and change the ratio between the two resistors, maybe try a 6K8 and 3K3 for instance if you want slightly more treble or swapped round for more bass. Cool ;o)...I also found that completely omitting the 220n on board gave a huge treble/fizz increase ... not bad, but not to my liking... something else to play with for someone maybe. Man...i tried the 4 pots version, two times...now this one. just cant make it work. im using stripboards, can it be the problem? i test the circuit with just the pots, jacks and battery, without the pots...nothing happens. what i get at best was just the clean guitar sound. any tips? The ground on board circuit goes to the sleeve on the output jack, right? output on board goes to the tip in the output jack, input goes to the tip in the input jack, and sleeves from both jacks are conected for grounding. is this correct? can i send you some pics of my circuit? you can't test the circuit without the pots. for all intents and purposes, because of the pots, the strips that have a pot lead coming from them are connected BECAUSE of the pot. it's probably why you're getting nothing. i already tried with the pots before. think its a really nice and easy project to begin with, right? damn. Are you sure there are no bridges with that soldering? There are a few spots where the solder is certainly hanging over the next row and looks like it may be touching. That may want checking for unwanted continuity between tracks with a multimeter. Also some of the values look like they maybe wrong. The top right hand most resistor is supposed to be 10K, but on your board I see those colours as red-green-orange-gold which would be 25K? To be honest, It looks to me like you probably have quite a few bridges.. if you have a small hacksaw or similar to seperate the tracks and there looks like a break in the track to the far right..
shame on me. i switch the 20k and 10k resistors. sorry, yeah, i'll try again today and i post the results here. the begining is that hard i think. really really thanks for your kind attention. Hi, Guys, does the ground from the 10K pot go to sleeve of output, please? It goes to anything that's grounded. Whatever is neat/convenient for you. I usually just make sure my enclosure is grounded and solder the lug to the back of the pot. Got it working after a fair bit of debugging, really smooth and loud! Hey what was the fault?I have the same problem! stupid question considering the name of the pedal, but anyway to easily achieve a little less wool? What switch should be used for this project? Anyone have any pictures of this thing wired to the stomp switch and toggle for a visual aid when building? Just pretend that the input of that pseudo-board in the guide is the lug 2 of the switch and output is the lug 2 of the output pot. Ok guys, I need a little help. I don't have any 220nf caps, I do have 100nf caps. Di I put these in parallel? When I look this up online it says caps in parallel add rather than divide like resistors. Is this correct? Yes I think you are right. Putting caps in parallel will add while in series divide. If I only want the less bassy input capacitor, should I go with the 220n or 22n one? Thanks. Go with 22n, smaller caps filter out low frequencies, bigger ones let them through. It's always a good idea to socket input and output caps so you can experiment easily. THis was the frist pedal I have put together and it sounds great! All I had for an enclosure was an ipod case looks kind of cool. Thank you so much for this site. I have assembled many pedal kits, but this is my first foray into stripboard. I built two- one for me and one for a bandmate. Both builds took a bit of troubleshooting, but with the clear instructions and detailed comments I was able to de-bug them myself. Thanks again- time to try some more! Is this essentially the Fuzzolo? It has only volume and pulse width. I'm confused about the top right corner of the diagram… Is that a little daughter board of some kind or a dpdt switch (or neither)? I've got the board all ready to go but I'm stuck on that. This is only my 2nd vero build, so please excuse my newbie question. Any help is greatly appreciated, thanks! ok ive been trying to figure this out for a while, and i know it depends on the cirguit, but in this situation how would i modify it so that i could use a 50k linear pot instead of a 10k? I have a radioshack 10k linear pot but its so huge it wont fit in enclosure , i have already drilled it a while back for a different circuit, but luckly its 2 pots and a switch, any replies would be a huge help, I have a bunch of pots but it seems like the circuit i wanna build im always missing something. What is the 4k99 resistor about? Do I use a 5K resistor thats not quite 5k?? 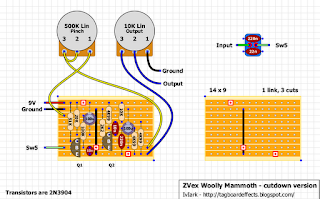 I've built a ton of pedals over the years, don't quite understand what thats about.